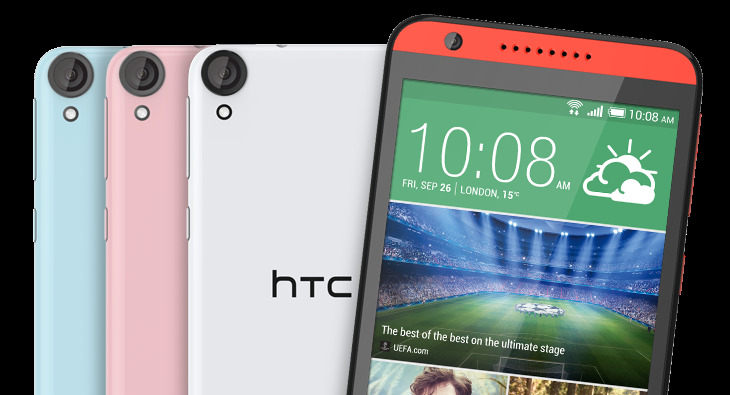 Though the HTC Desire 820 has been enhanced and upgraded on many fronts, there is still one drawback that needs to be addressed. Find out what is new with the Desire 820 and what needs to be tweaked. With so many big brands coming out with newer models ever so often, it is only but natural for one particular brand to take a backseat. HTC was faced with such a situation last year, until of course the HTC Desire 816 happened, and pushed the brand's value a fewer notches up. The Desire 816 was a mid-range smartphone, but what worked for it was that it ran the Android's latest version, it had a huge screen that was quite impressive, the camera was capable of capturing stunning pictures and it came with BoomSound speakers. It had all the right elements that could draw prospective buyers. Just 6 months down the line and the smartphone giant announced the Desire 820. A smart device designed to take over the reins from the 816. The Desire 820 is a visually more appealing phone than its predecessor. Apart from that there have been notable additions made to the internal specs. The phone is fitted with the latest future-proof 64-bit octa-core processor, in addition to having extra internal storage space, a little more RAM and an improved front camera. The phone only got better for consumers looking for a decent mid-range smartphone. Let's get to know the HTC Desire 820 a little better. 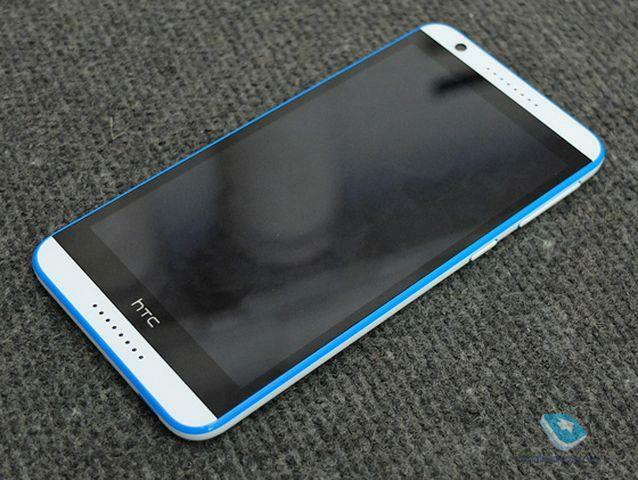 At first glance the HTC Desire 820 looks pretty much like the Desire 816. It has similar dark borders surrounding the screen, with strips across the top and bottom for the trademark Front-firing BoomSound speakers. The BoomSound speakers produce an incredible sound effect. They produce the same incredible sound over earplugs as well. They are easily the best speakers available in smartphones. There is an attempt to make it aesthetically more appealing by giving it a striking two-toned exterior. That doesn't work though as the smooth and overly shiny plastic finish looks cheap and attracts smudges and scratches quite easily. However, this is a minor issue which a Dot View phone case can resolve. There is a wide choice of colours to pick from, and you can have your pick from the Milky-way Grey, Saffron Grey, Marble White, Blue Misty, Santorini White, Flamingo Grey, Tuxedo Grey, Monarch Orange and Tangerine White. All variants have contrasting colour accents, for instance the Santorini White has blue accents along the rim on the front, with the blue accent outlining the volume rocker and power button located on the right edge, the micro-USB port situated at the bottom edge and LED flash and ring around the camera at the rear. 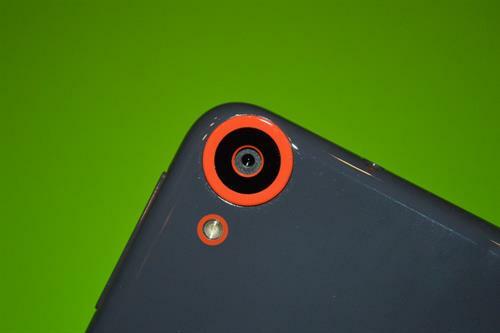 A protruding plastic ring protects the rear camera lens. The 3.5mm jack and the microphone are on the top edge of the device. On the left edge is a single flap that conceals a microSD card clot and 2 Nano-SIM card slots. The Desire 820 has a 5.5 inch screen and 720x1280 pixels resolution, much the same as the 816. Despite this the colour reproduction remains fairly decent, with fairly good viewing angles. However, the brightness level could have been better. The HTC 860 is powered by Qualcomm's new 64-bit octa-core SoC intended for the mid-range phone variants, and Snapdragon 615 that uses four 1.5 GHz Cortex-A53 cores along with four 1.0 GHz Cortex-A53 cores, and the Adreno 405 GPU. HTC has improved on the 816 by bumping up the RAM in the 820 from 1.5GB to 2GB. Internal storage capacity has also been doubled, from 8GB ROM to 16 GB. Additionally, the latest version allows storage devices to be connected using the microUSB port and is capable of processing microSD cards of up to 128GB. With an 8 megapixels front camera and a 13 megapixels primary camera, with LED, the Desire 820 allows for a better camera experience. The camera offers a wide range of shooting modes including Auto, Manual and Panorama settings. Depth of Field mode mode most definitely boosts the cameras performance, and the Photo Booth also deserves a mention, as it comes with different filters. The camera app further enhances the experience. The Bluetooth v 4.0 allows easy connect with other devices. Further, it comes with apt-X support that greatly enhances streamlined audio sound. The device can be connected to LTE networks that work on 2300MHz frequency. Regular connectivity options, such as the Wi-Fi Direct and Wi-Fi a/b/g/n are also available. The battery remains the same as that fitted in the Desire 816 (2600mAh). The UI 6.0 skin currently runs on the Android 4.4.4; however, there's an HTC assurance that the 820 will be updated to the Android Lollipop soon. The user experience is enhanced by the inclusion of third-party apps – Wechat, Facebook and Polaris Office 5 as well as HTC Zoe. The poor battery life is the only snag in the Desire 820. The battery runs out of juice pretty fast especially during a video loop. This is one aspect that takes the shine off the phone. At Rs.24,990 the HTC Desire 820 is definitely a more advanced and superior device than its predecessor. An eye-catching exterior, an outstanding camera, and better capable of managing different tasks takes this phone a few notches above the Desire 816. There are a few more phones that you might like to consider, falling as they do in the same price range. Like the Lenovo Vibe X2 and the Gionee Elife S5.1. All phones falling in this price range come with their (minor) flaws; but that does not stop them from standing out. HTC is coming up with many newer devices these days. The review really puts forth every detail of the phone giving a special attention to the newer developments. Great that HTC has been constantly upgrading the spec sheets of their devices. Looking forward to try this one. HTC did slip down the ranks early last year, but then was quick to come back. The company has adopted a very smart strategy of launching new smartphones every couple of months. This allows buyers a wider choice and HTC gets a lot of publicity because of the constant new entrants it pushes into the market.